The worship of Devi Durga in the month of Ashwin is called 'Akalbodhan'- an uncustomary time for commencement of the worship. Hence this puja is called Akalbodhon. In the 'Ramayana', Rama went to 'Lanka' to rescue his abducted wife, Sita, from the grip of Ravana, the king of the Demons in Lanka. Before starting for his battle with Ravana, Rama wanted the blessings of Devi Durga. He came to know that the Goddess would be pleased only if she is worshipped with one hundred 'NeelKamal' or blue lotuses. Rama, after travelling the whole world, could gather only ninety nine of them. He finally decided to offer one of his eyes, which resembled blue lotus. Durga, being pleased with the devotion of Rama, appeared before him and blessed him. The battle started on the 'Saptami' and Ravana was finally killed on the 'Sandhikshan' i.e. the crossover period between Ashtami (the next day) and Navami (the day after). Ravana was cremated on Dashami. 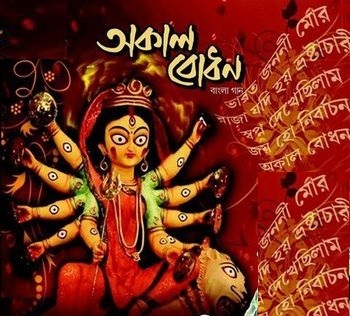 Since the period of this worship was different from the conventional period (during the spring - 'Basanta'), this puja is also known as 'Akal-Bodhan' or a worship (Bodhan) in an unconventional time (A-Kaal).